Country Life L-Lysine - An essential amino acid important for growth, tissue and collagen formation. B-6 aids in the utilization of Lysine. RECOMMENDED USE: Adults take 1 capsule daily with or without food. This product contains NO: gluten, yeast, wheat, soy, milk, salt, sugar, preservatives, artificial colors, flavors or sweeteners or GMOs. This product also contains: Cellulose (capsule shell), silica, magnesium stearate. Q: Where can you find L-Lysine? A: Lysine is found in meat and dairy products. Q: What are the nutritional functions of L-Lysine? A: L-Lysine inhibits the replication of double stranded DNA viruses and is used by the body for many different functions including eye health, immune support, enzyme production, hormone production, and bone health. 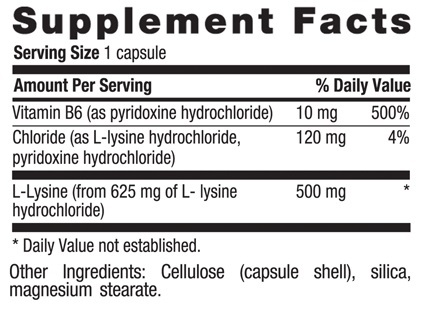 B-6 helps the body use L-Lysine correctly and efficiently.